Audrey Edmunds, mother of three, spent 11 years in prison for killing a baby she never harmed. And she is not alone. What happens when widely held beliefs based on junk science lead to the convictions of innocent people? 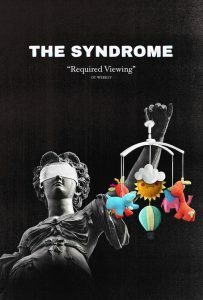 The Syndrome is an explosive documentary following the crusade of a group of doctors, scientists, and legal scholars who have uncovered that "Shaken Baby Syndrome," a child abuse theory responsible for hundreds of prosecutions each year in the US, is not scientifically valid. In fact, they say, it does not even exist. Filmmaker Meryl Goldsmith teams with Award-winning investigative reporter Susan Goldsmith to document the unimaginable nightmare for those accused and shine a light on the men and women dedicating their lives to defending the prosecuted and freeing the convicted. The Syndrome uncovers the origins of the myth of "Shaken Baby Syndrome." It unflinchingly identifies those who have built careers and profited from this theory along with revealing their shocking pasts. Shaken baby proponents are determined to silence their critics while an unthinkable number of lives are ruined.